For those of you who have read with both, how do they differ for you? What do tarot/oracle each have that you look for? Are there ideas in tarot decks that rub you the wrong way, but work in more freeform oracle decks and vice versa? Personally, I like the structure and the "story" of tarot, but its that same structure I often find to be a limiting barrier to my ever developing an intuitive reading style. Unfortunately, on the other hand, the vast majority of oracle decks I've encountered seem... incapable of giving you an answer you don't want to hear lol. It really depends on, well, you. Some people feel more connected with one or the other, which is completely okay. I've always felt a stronger connection to the tarot than the oracle cards. Oracle decks are usually pretty mute for me and generally feel absolutely nothing when I try to use them. At least with tarot I feel a connection, an intuition. For he who has truly lived never truly dies. the vast majority of oracle decks I've encountered seem... incapable of giving you an answer you don't want to hear lol. Oh, I like the way you put it, I feel that way but never knew how to say it. 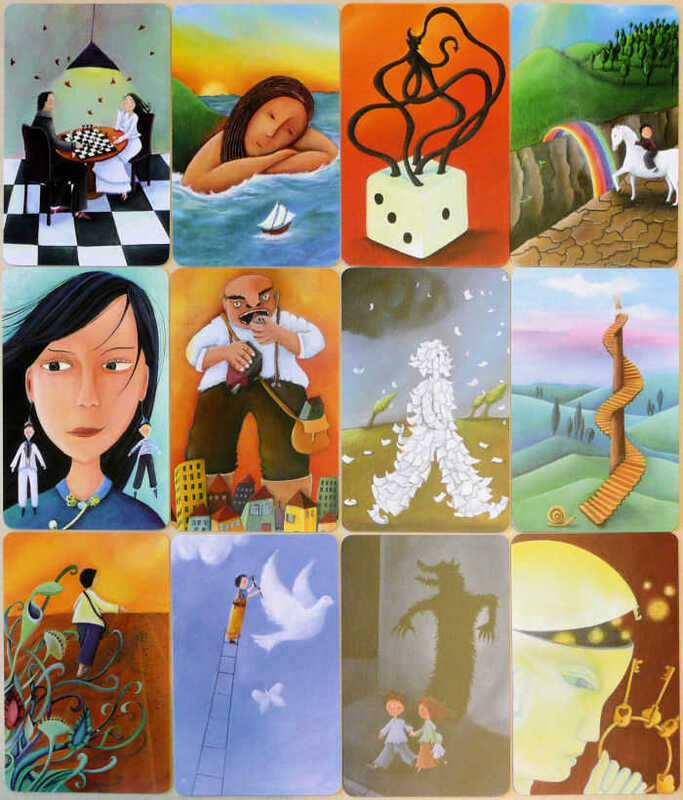 I like the tarot because of its rigor, I like that it has a history and rules and resembles playing cards. I'm not a "by the book" person so you might think when you see me read that I read intuitively but that's not my cup of tea at all, I like combining every knowledge I have about art history, math, sociology, ... And interpret a card with it. So tarot is more practical for that method than oracle decks, which tend to be more free-form and more about the personal expression of one or several artists. My favourite decks for cartomancy are neither tarot nor oracle though. For the past three years I've been absolutely partial to board game cards, unique playing cards and even trading game cards. I'm a trickster, and I worship luck, so I'm an enormous game enthusiast, and this is the closest to my personality when it comes to cartomancy. 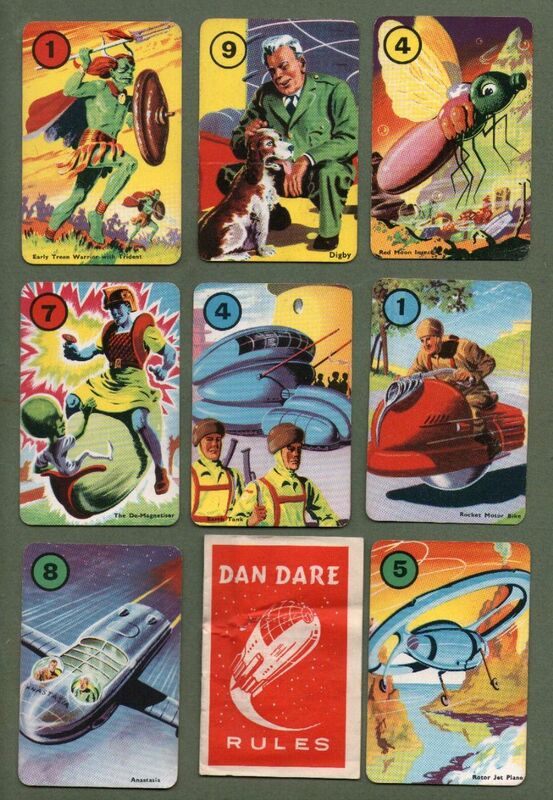 I've used cards from the game Dixit , vintage Happy Families games, my absolute favourite thrift shop find which is this Dan Dare futuristic card game. But my main deck that I use 90% of the time is the French version of Werewolf which has amazing yet myserious designs by the Greek artist Alexios Tjoyas, medieval inspired lore for each card, and a set of rules so fun and intricate that I have more than a hundred pages of notes and study about how to read it. 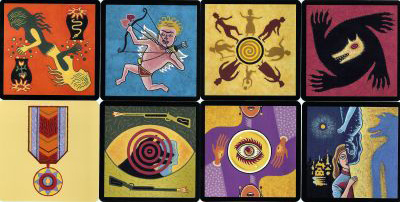 From a scholarly/intellectual standpoint, I love Tarot for the many layers of meaning in the cards. When I read with tarot, I don't only look at what each card says, but what the suit says, is it minor/major, how many of the same suit, are there repeating numbers...there is just a whole lot more for me to examine. Having said that, I am a very intuitive reader, so Oracle cards work very well for me. I read what the image says, and I pick my decks carefully (I know what art tends to work for me, and what doesn't...if the cards don't speak to me, I won't keep them, I'll find someone to pass them on to). I have probably as many oracle decks as I do Tarot. And almost as many symbol based divination systems (runes, WomanRunes, Witchrunes, charm oracle...) I love the variety this offers me. I find that each system gives me different things, some work better for some things than others. When I go to do a reading (I almost exclusively read for myself, though I have done readings for friends), I'll pick what system feels right for that subject/day/moment, and go from there. I really dislike systems that are too minimalist or have multiple cards/symbols that represent very similar ideas. Decks that just have X number of whatever suit on the minor or guy/girl sitting on throne wearing different clothes don't work for me. I've also seen some symbol sets where there were like five different symbols for different types of relationships (all kind of similar) which bugged me as well. I actually find the structure in a Tarot deck really informative - it's part of why I find oracle decks harder to read with (though often useful for a 'pick a card/meditate/reflect' uses, or getting additional commentary). That said, I do use some. I most commonly do it alongside Tarot (one quote deck card per Tarot card in the spread) - it doesn't work well as a single card pull or without additional structure, but with that structure from something else, it tends to be pointed but not nasty. 2) The Tangled Roots Oracle created by Leora Effinger-Weintraub, a friend of mine from my time living in the Twin Cities. 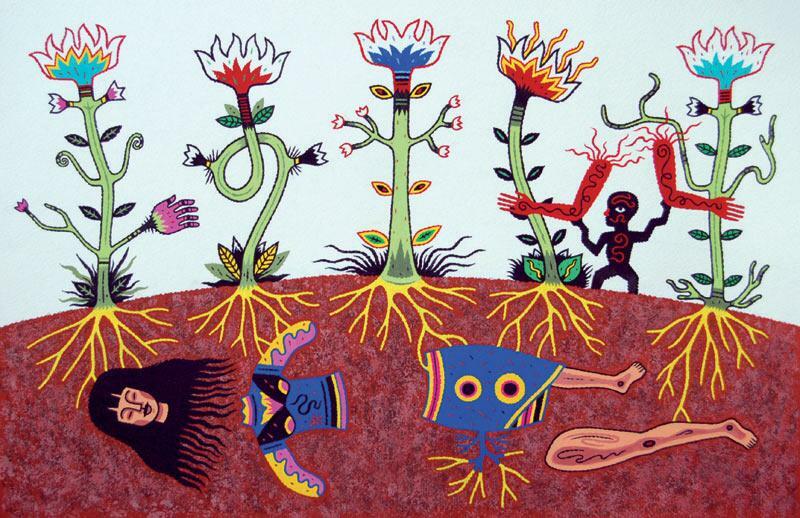 It's a deck with particular location and worldview roots: as she says, "The Tangled Roots Oracle is a 52-card oracle deck rooted in the ecstatic tradition of the Upper Mississippi River Reclaiming community in Minnesota, USA." I mostly use them for altar focus and sometimes for laying out patterns so I can see them (cat allowing) more clearly. I haven't found a personally satisfying way to read them as a oracle deck yet. Could you go into that a little bit more? I've met a number of people who use multiple divination systems/decks for readings and I'm curious how that works for you. Sure! I learned the idea from other people who did something similar - they normally do it with Tarot and runes, but I've seen Tarot deck and oracle deck, or fairly traditional Tarot and less traditional, or two oracle decks. I do the tarot card spread, as I would for any Tarot reading, and then I lay a quote card for each one. I lay things face down, and turn them over position by position, so I can get a sense of how the two play against each other (and with the position) before looking at the whole spread. With the quote deck alongside the Tarot, I look at the way each Tarot card plays with its paired quote deck card (often the quote card will illuminate which aspect of the Tarot card to pay close attention to), and often there will be a layer of advice/commentary in the angle of the quote cards that helps flavour or tie together the reading. Oh, quote divination is such a good idea, I've seen stichomancy books full of quotes but for a reason never thought of making one with quotes that speak to me... Your quotes are very inspiring too. I find that Tarot decks are more good at giving "universal" readings--which I put in quotes because no symbol system will ever be truly universal, but it's true that Tarot is well-known and has a decent amount of history, commentary, and familiarity attached to its symbolism. Non-Tarot decks, on the other hand, are going to be more specialized to specific systems, often ones still in development. I use both Tarot and something called the Night Sky deck. The latter is a deck of playing cards designed to help people learn constellations, but I read it as an oracle because my practice draws heavily from Classical Greek religion and culture, i.e. the same background as most of the constellations included in the deck. It tends to be better for my personal stuff, considering that. Given your problems with finding most non-Tarot oracle decks too gentle, it might be helpful to look for oracle decks and possibly other divination tools that aren't originally designed for divination. Aside from the Night Sky deck, I also use something called Story Dice (in the form of both an app on my phone and actual physical dice), which are dice with random images on them designed to inspire ideas for writing. Thanks! I started it back during my early witchy training when I had a really hard time connecting with Tarot (I am not a visually motivated person: colours yes, images no.) It's turned out to be a fascinating tool. I don't allow myself to add quotes unless I can flip to the scene they occur in fairly reliably, so they're books I know really well. Interesting. Because the tarot story strikes such a chord with me (though, apparently, less in a divinatory sense), I have used it a number of times to help with writer's block, or to sit down with a story and figure out what it wants from me as its teller. I'm actually developing my own oracle/cartomancy deck - I hope to have the symbolism planned out enough to rival some of the more thought-out tarot decks (versus just... people making decks not because they like and use tarot but because they like the idea they want to make a tarot deck out of). I'll be posting it once I have adequately conveyed that I'm not here to spam lol. Though I do want to see what feedback on the art I might be able to get. I wonder what would happen if you tried a reading using a Cards Against Humanity pacK? Tried it! It's a fun practice to see if you're able to interpret anything. I didn't like it as if cause the answers are too short but maybe I should try paired with tarot like Jenett's quotes. I tried it with another diviner friend and despite not getting very good answers to our queries we had a lot of fun that night. That does sound like fun! Did you phrase your queries with blanks, like the C.A.H. question cards? I, for one, couldn't imagine doing it any other way! What tarot (or other oracle) decks do you have? Page created in 0.415 seconds with 54 queries.